Vespa GTS owners are always looking for new goodies for their scooters so these new CNC machined levers will be worth adding to the Christmas list. The levers are available in short fixed blade, short folding blade, or with a folding adjustable length blade design, with all three styles having ‘on the fly’ adjustable lever reach. These levers also feature a large flattened ball on the end for a reassuring grip on the lever. The folding levers are designed to pivot away from the point of impact should a tumble occur allowing the handlebar end to take the impact. This unique feature can be a true ‘lever saver’, hopefully allowing the rider to pick the machine up and carry on with their journey, safe in the knowledge that they still have both brake levers in working order. 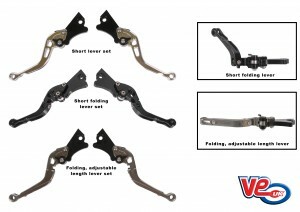 Short adjustable lever set (SRP £46.50): Alloy, Black, Titanium. Short folding adjustable lever set (SRP £55.80): Alloy, Black. Adjustable length, folding lever set (SRP £59.90): Alloy, Titanium.